The Funny Thing About Peas…. And of course, he is right. The garden does look silly. I planted my peas yesterday, and protected them with milk jugs. Not against the cold, but against the marauding chipmunks. Last year, the chipmunks wiped out my entire bean crop, and almost all of my peas. I am determined that will not happen this year. 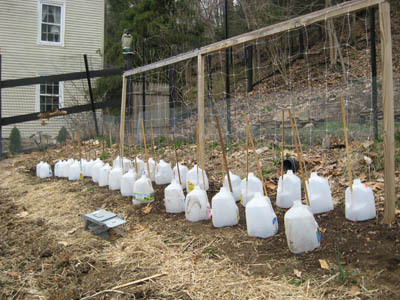 So I planted Maxigolt, Green Arrow, and Snow Sweet snow peas yesterday, and placed the milk jugs over them. (The bottoms of the jugs were, of course, cut out, to allow the jugs to act as “cloches.”) I anchored the jugs with long slender sticks. 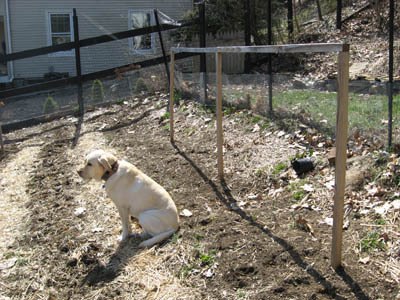 For the peas that are not planted beneath the trellis, the sticks will become their support. 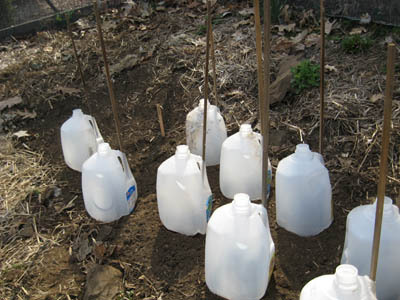 I plan to remove the milk jugs once the plants are a few inches high. 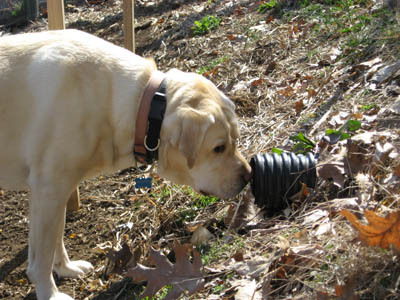 By that time, I hope to have caught this year’s first batch of chipmunks and relocated them elsewhere in the county. 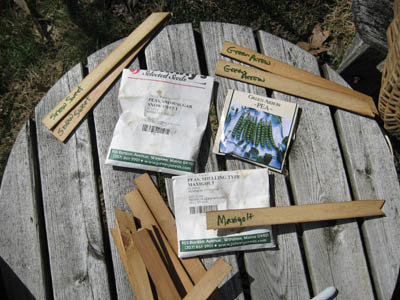 The three seed packets, and identifying stakes, ready to go. 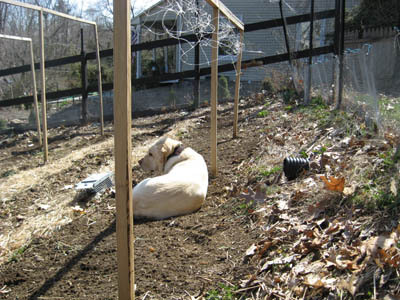 Before Husband came out to help me put the trellis netting up, I went into the garden to prep the beds. 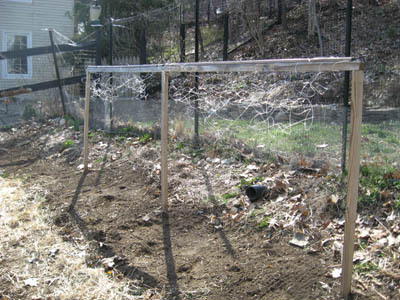 The trellis was attached quickly, waiting for me to anchor the plastic netting to the dirt with lawn staples. I asked MacKenzie to come sit with me for this photo, to offer an unobstructed view. Looking over her shoulder, just in case. Keeping an eye on both the trap and the drain proved tiring. ...sit up, and survey the best vantage point for her next patrol. 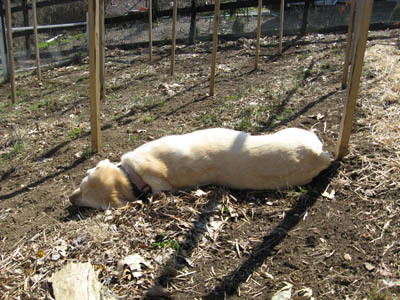 I started with Maxigolt peas, on the western side of the bed. 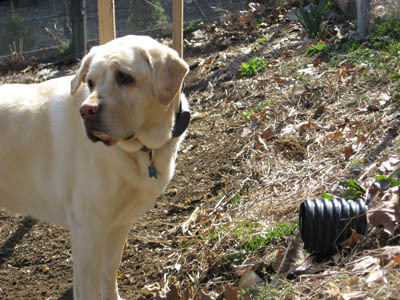 I will plant the northwest corner with cosmos, and the southern edge of the bed with parsley, but in-between, several jugs’ worth of Maxigolt peas! An inelegant solution, but hopefully an effective one. I hope the unsightly milk jugs keep the pea plants safe until they are firmly established. I hope the chipmunks either find their way into my hav-a-hart trap or find the seed from the bird feeder — on the other side of the property — enough to keep them well away from my peas and beans this year. I hope MacKenzie continues to help me every day, and that my neighbor keeps his sense of humor. The rewards in shared produce will be great. I’ll trade a basket of fresh peas for a good attitude any day. Kudos to your assistant. And so photogenic! The garden looks good. I’m sorry I won’t be around to beg any excess.